Appealing to a wide range of tastes and expectations, Lovely Square Breakfast and Lunch has already found its way into the hearts of Sarasota residents, despite only recently opening Nov. 2018. Created by a French couple looking for a fresh start in the United States, Lovely Square customers get to experience a fusion of French and American cuisine, all inside a small-yet-cozy Gulf Gate cafe. Upon entering the restaurant, customers will immediately catch sight of the European-style decor- it maintains a simple yet modern atmosphere, without sacrificing comfort and style. The restaurant is normally full of customers, but the dining area is large enough so that guests do not feel cramped in any way. The exterior wall is made up mostly of large windows, allowing lots of natural light to flow in. Bright colors decorate the walls and are incorporated into much of the furnishings, further amplifying the light and clean atmosphere. Lovely Square has ensured that all of its guests will thoroughly enjoy their meal, and will happily accommodate vegetarian or vegan customers. The menu incorporates French cuisine into a traditional American breakfast restaurant. Dishes served extend from eggs Benedict to soups and salads to breakfast sandwiches. French pastries are also served at the table or can be bought near the front entrance of the restaurant. 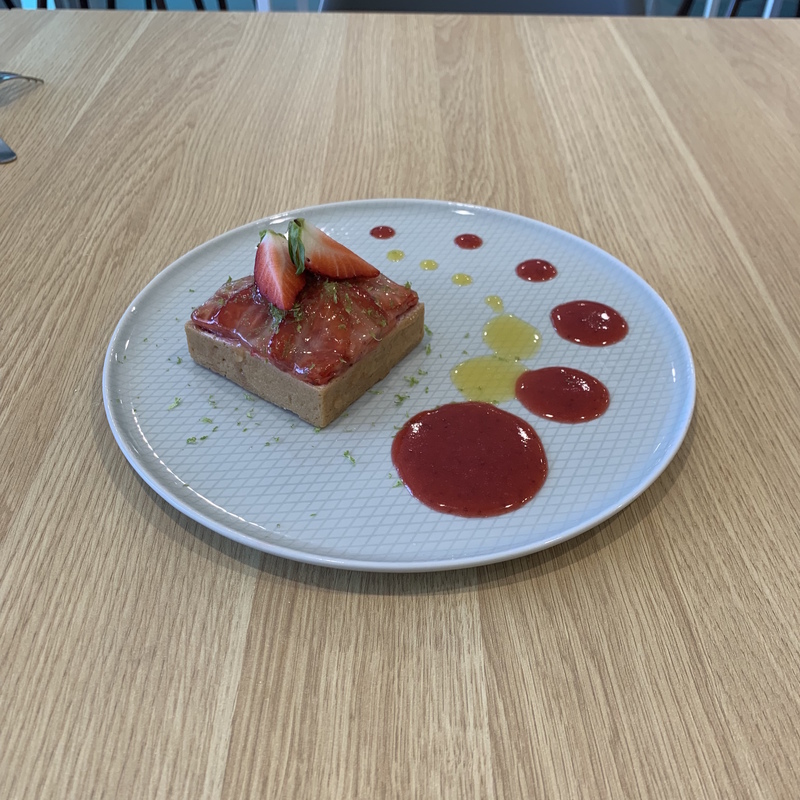 The daily special, strawberry baba, was a delicious strawberry pastry, similar to a pie, but much less sweet. It had a citrus flavor as well, and was the perfect size to share with a few friends or family members, but was a little pricey, at $4.50. The eggs Benedict was delicious. 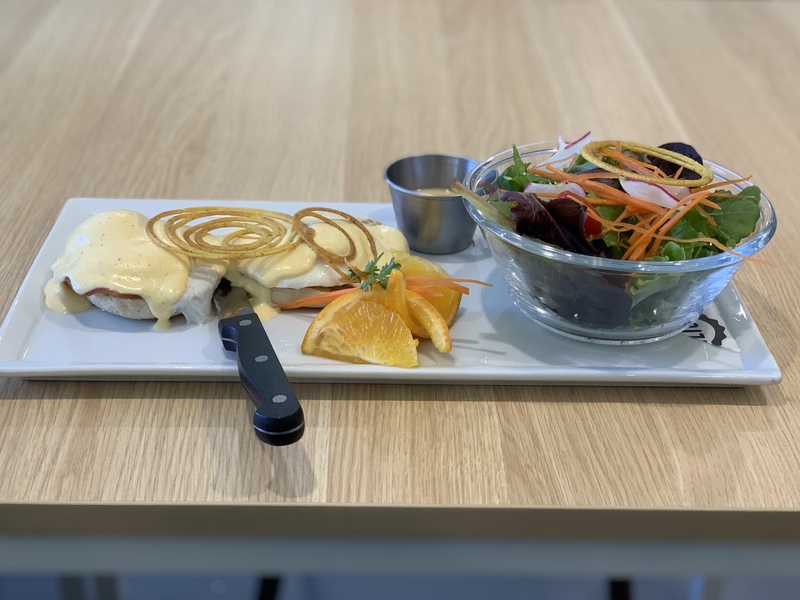 The eggs were perfectly cooked, the English muffin was appetizing, and most importantly, the Hollandaise sauce had the perfect amount of lemon flavor and was a great addition to the dish. Further, the dish comes with a side salad or home fries. The home fries are well-seasoned, and the salad dressing is light and not too rich. The staff is very helpful and makes certain their guests are enjoying their meal, asking if they can do anything to help better their time at the restaurant. The food came out of the kitchen very quickly, and the presentation was beautiful. It is no surprise that the food is delicious, as the owner is a French chef who ran Italian and French restaurants in South France for 20 years. When looking for an easy place with a central location that easily satisfies any taste buds, Lovely Square is the place to go. With reasonable prices, amazing food and a perfect atmosphere, it is hard to find a more enjoyable breakfast cafe in Sarasota. Lovely Square is located at 6559 Gateway Ave, Sarasota, FL 34231 and is open from 7:30 AM to 2:30 PM daily.